The key theme for Spring at CENFACS is Rebuilding or Renewing Lives, Infrastructures and Institutions. In other words, Spring Relief is the season of rebuilding from what has been destroyed by wars, natural disasters, bad economic management, mistakes of the past etc. We need to rebuild in order to reduce poverty, stop its re-appearance and avoid the emergency of new types of poverty and new generations of poor people. The Winter Season of Light, which is ending in a couple of days, gives us an opportunity to bring some lights and hopes to those in most need so that they can find the reasons to believe in life again. The Season of Light tackles poverty as a lack of hope and expectations. However, our work does not stop there. In Spring, we take the challenge of working with those in need to rebuild their lives, infrastructures, buildings, development of relationships, communities etc from the damage, loss and worse change experienced or caused. So, the key words for the Spring Season are rebuilding and renewing. We shall come back on these words with our advocacy project about Rebuilding Africa. We have provided under the Main Development section of this post a selection of projects and programmes which will make this Spring – Spring Relief season. As said, it is a selection. Therefore, one should expect the introduction of new activities and the continuation of ongoing initiatives like our all year round projects. That is to say, there will be additional projects and programmes as we progress throughout this Spring season. To reflect CENFACS’ Q Year Campaign in our Spring projects and programmes, we have provided some highlights about three components of Q project, which are: Historical Survey of CENFACS’ Protection Work since 2006, Volunteering Story of CENFACS’ since Creation, and CENFACS as a Quadranscentennial (Q) Creation. CENFACS’ Annual Spring Appeal for Renewing Life (ReLive) will focus on advocating for support to the peoples of the worst affected areas of flooded African countries. So, the Eleventh Issue of ReLive will deal with Flooding African Countries. The focus will be on African countries that have experienced continued floods and torrential rains which often damage homes, roads, other infrastructures (like health and educational ones), cut off communities as well as create human fatalities and misery. As before, there will an appeal case under our Life-Renewing projects or gifts for the victims of floods in Africa. The details of the Gifts for Renewing Lives will be released by the middle of Spring 2019. The Spring 2019 Issue of ICDP resource will focus on Climate. Whether we go away or stay at home or even we are on the move for holiday; we need climate or weather information and knowledge about precipitation, temperature, wind velocity, sunshine, humidity etc. To achieve a successful holiday, we need to be aware of and do something about the climate. The 2019 Spring Edition of ICDP speaks about climate (i.e. the average atmospheric conditions prevailing in a region) and nine basic life-sustaining goods (that is food, shelter, health, protection, education, housing, clothing, water/drink and freedom). It looks at how these nine variables connect with climate to smooth the enjoyment of our holiday. It provides some indicative advice, tips and hints on how to handle these elements in relation to climate (whether it is extreme or good or bad or moderate or better) so that our holiday is not adversely affected by climate conditions. Briefly, the 2019 Spring Edition gives some insights into the way of integrating a climate dimension to our holiday whether we pass it at home, away or on the move. Our two weeks of action (on Energy Transition that started on 04/03/2019 and on Climate Finance and Insurance that began on 11/03/2019) were run smoothly and productively. The Energy Transition action was about the passing from fossil fuels to renewable energy, while Climate Finance and Insurance concerned the mobilisation of sources of finance and cover/protection to reduce adverse effects of climate change. We would like to thank all those who supported them. 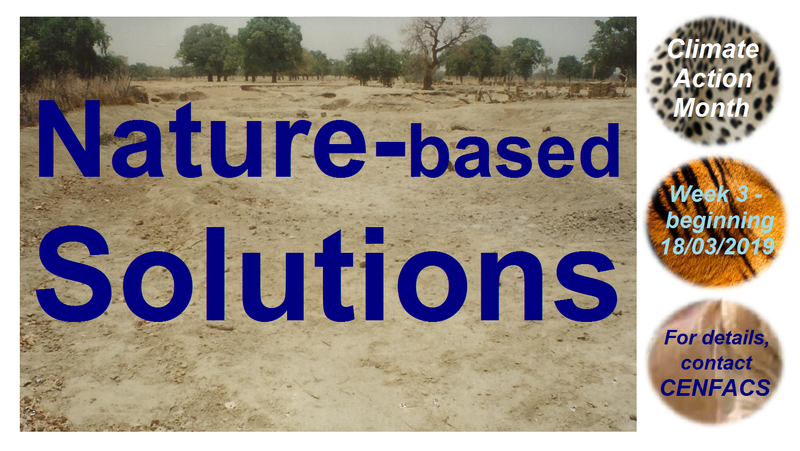 In this week three of our Climate Action Month, we are continuing our advocacy with the theme of Nature-based Solutions (NBS). It is about taking actions for better use of nature and natural functions of healthy ecosystems to help reduce the impacts and effects of climate change. The NBS will revolve around the following actions: reduction of water pollution, water security, food security, disaster risk management, sustainable management etc. These are actions to enhance nature with its components. Additionally, this week’s NBS will bring to light some of the good practices and actions carried out by our Africa-based Sister Organisations. We shall finally include NBS for poverty relief. To support and or engage with the contents of this week’s climate action, please contact CENFACS. The discussions and thoughts about CENFACS’ 2020s Development Agenda are scheduled for this week. As previously said, these discussions and thoughts are carried out in parallel with the review and evaluation of the 2010s Programme. CENFACS is pleased to present its new season Spring collection of selected projects and programmes with a choice of relief services. For every of these projects and programmes, you will find user-friendly and –centred relief. These projects and programmes are free but we do not mind donations. The more you donate, the more we can relieve. Please find below the core highlights and full selection of Spring Relief projects and programmes. These highlights concern three sub-projects or activities of the Quadranscentennial (Q) Year and Project for this Spring, which are: Historical Survey of CENFACS’ Protection Work since 2006, Volunteering Story of CENFACS’ since Creation, and CENFACS as a Q Creation. The historical survey and process of CENFACS’ protection work since 2006, which is part of Q Project, is the study of CENFACS’ work on protection since it began it through the programme Peace, Protection and Sustainability. It is an investigation about our legacies in advocating for a sustainable cover to unprotected or less protected, vulnerable and poor people, especially but not exclusively women and children. It is as well the legacy of work carried out with Africa-based Sister Organisations on this matter. This is another activity of Q Year and Project. Since its inception in 1994, CENFACS started as a voluntary organisation made with people willing to do something about poverty and hardships without firstly thinking of making money out of it. This founding idea has been underlying in our work until today. Men and women from all walks of life voluntarily came and joined us to fulfil this altruistic philosophy in our journey in making helpful difference in the lives of others. This is our volunteers’ story, the story of all in development volunteers. CENFACS is a make for the relief of poverty and hardships that has lasted 25 years. The Q Creation element of the Q Project provides an opportunity to go in depth about the theory of existentialism and of extirpating the existential feature of CENFACS to understand for example why some creations last longer and others live shorter, even disappear. Because CENFACS exists, it has an essence. The humans who make CENFACS are active and creative. It means that as CENFACS is an existential moral person, we need to find out the dynamics within CENFACS which has kept it to reinvent and rejuvenate its self as an existential model of working with local people, as well as to understand the functionality and structural power relations within CENFACS which have kept it going. In doing so, we can pull out some lessons for learning and development about creations in the field of poverty reduction and development. The following selected initiatives (selected for public information) are amongst those which will make Spring Relief 2019 at CENFACS. May Stories – Entries for Stories on Poverty Relief and Development for May 2019 are now open. To tell your story of change for change to CENFACS, contact CENFACS for story telling terms and conditions. The above initiatives are only a selection of what we have planned for Spring Relief season. We may introduce new initiatives and or upgrade the existing ones depending on the circumstances as we have from time to time to respond to emergencies and urgent humanitarian issues. In which case, we shall let you know. Also, in every work we do to try to help reduce poverty, there is always a cost to bear. If you could help alleviate some of our costs, we would more acknowledge your support than just appreciate your gesture. To request further information about Spring Relief projects and programmes, please contact CENFACS.